Mutant Abilities: None initially, but was later equipped with cybernetic enhanced limbs, including hands with built in retractable adamantium claws. In addition to cybernetics, she was infused with a healing factor on the same levels as Wolverine and Sabretooth that protects her from injury, disease, and aging. History: In an environment and culture where honor and shame were of great importance, Yuriko Oyama dealt with the worst of both. From the moment she was born, she carried a great shame that left her shunned and ostrasized by everyone around her, including her own family. Her name and her legacy carried no honor and much of her life has been spent rebuilding it by any means necessary. Yuriko’s shame was thrust on her before she was even born, stemming directly from a transgression by her father against the Yashida Clan, who were one of the most powerful Yakuza crime families in Japan after World War II. The Oyama family once enjoyed an unblemished reputation among the Yashida Clan. They worked together in forging a very successful and very sophisticated criminal network. For many years, the Oyama’s influence was second only to the Yashidas. As a result of this close collaboration, it was not uncommon for the two families to intermarry. However, Yuriko’s father seriously undermined that tradition by marrying one woman from the Yashida family and having an affair with another. That affair resulted in Yuriko’s birth and the subsequent demotion of the Oyama’s from Yashida Clan affairs. While her father narrowly avoided severe punishment for his crimes, the shame would be carried by Yuriko for much of her life. Growing up in Osaka, Yuriko was an outcast within her own family. Her mother frequently neglected her, having also been shamed for her illicit affair. She avoided showing Yuriko affection, forcing her to fend for herself at a very early age. Her father did his best to protect her, often referring to her as the most beautiful mistake he ever made. Since his wife had miscarried twice and given birth to a weak boy with little potential, he treated Yuriko with a special kind of affection. However, that didn’t stop others from reminding her of her shame. She was routinely bullied by other children amongst the various crime families and at one point in her life, she was tied to a tree half naked in the middle of a blizzard. She was only rescued when her father came looking for her. Such neglect and scorn left her an angry, embittered child. As a result, she took up ninjutsu at a young age and trained to fight back. Being in the Yashida Clan, she had access to some of the most proficient ninjutsu teachers in Japan. She took her lessons seriously and quickly developed an aptitude for them, so much so that by the time she was 10-years-old she was already besting boys older than her. However, her anger over her shame was tempered by the caring affection of her half-sister, Mariko Yashida. Of all the other children in the Yashida Clan, she was the only one who treated Yuriko kindly. As a result, Yuriko and Mariko developed a special bond. They both trained in ninjutsu, learning the ways of the warrior and the responsibilities of the Yashida Clan. Whereas Mariko was calm and focused, Yuriko was often angry and hot-headed. Together, they formed a formiddable duo and established themselves as future assets to the Yashida Clan. As teenagers, Mariko and Yuriko became involved in various Yakuza activities. They started out as thieves and enforcers, overseeing the theft and transport of various goods. As they got older, they graduated to more ambitious activities. And as a result of these activities, they ended up crossing paths with a mysterious man named Logan. He was originally discovered as a prisoner of a rival organization in South Korea. He was a dangerous man who demonstrated uncanny rage, which allowed him to kill most of his captors. While the Yashidas rarely recruited outsiders, they saw a great deal of potential in this man because of his durability and rage. As a result, the Yashida’s offered him sanctuary. Having nowhere else to go, he accepted and Mariko took it upon herself to train him. Yuriko helped, but this created a difficult situation that would drive the sisters apart. In training with Logan, Yuriko developed strong feelings for him. However, Logan made it clear early on that he cared for Mariko. The two became very close, so much so that there were talks of Mariko seeking permission to marry this outsider. It’s not clear whether Yuriko pursued Logan or if he returned her feelings in any respect. But it left Yuriko isolated again and shunned by her family. As the two sisters grew apart, another threat emerged from within the Yashida Clan. Pressure from law enforcement created a growing power struggle. Many of the Yashida’s top associates were arrested or killed, leaving a power vacuum. Among those trying to fill that void was Mariko’s brother, Harada Yashida. As the oldest son, he believed he deserved to be leader of the Yashida Clan. He even adopted the mantel of Silver Samurai, one of the most important titles that could be held. But his arrogance and his incompetence led him to fall out of favor and for a time it looked like Mariko would take over. This lead to an act of betrayal that would change Yuriko’s life forever. It started with her father, who had spent years making amends to the clan by working as a researcher for their science division. One day he revealed to Yuriko that he had been responsible for creating the adamantium bonding process that led to Weapon X, which had given Wolverine his adamantium claws. He said that their rescue of Wolverine was no accident and if they could reverse engineer the process, then the Yashida Clan would be poised to dominate with an army of enhanced warriors. At first, Yuriko was disgusted. But she reluctantly agreed to help him, which involved working with Haranda to subdue Wolverine for an experiment. But Harada took it a step further. He secretly made a deal with the rival organization, the Hand. And together, they launched an attack against Wolverine and every rival faction in the Yashida Clan. As a result, most of the competing families were killed, including Yuriko’s mother and Mariko’s father. But in his effort to fight back against Harada, Wolverine erupted into a berserker rage that led him to kill both Yuriko’s father and Mariko. Yuriko survived the attack, but was seriously wounded. Harada’s betrayal along with Wolverine’s crimes filled Yuriko with an uncompromising rage. And despite being wounded, she managed to save what was left of her father’s research and go into hiding to avoid Harada’s wrath. Not much is known about what happened to her after this time. Harada apparently put a bounty on her head and began using her father’s research as well, allegedly using it to give himself a weak healing factor that allowed him to avoid aging. But while he strengthened his grip on the Yashida Clan, Yuriko began plotting her revenge. Using her father’s research and resources from an unknown party, she subjected herself to a series of experiments that augmented her physical form with cybernetics. She even gained a powerful healing factor that allowed her to survive an adamantium bonding process similar to Wolverine’s. Armed with this new form, she became a feared assassin who began prowling the criminal underworld of Southeast Asia. Her activities undermined many of Harada’s operations and her father’s research has been linked to dangerous mercenary groups such as the Reavers. But the true extent of her activities is unknown and with the death of Harada Yashida, her intentions remain unknown. However, she is still known throughout the world as a dangerous and deadly criminal. Character Breakdown: The concepts of shame and honor are the cornerstone of Japanese culture and in many ways, Yuriko Oyama is guided by these concepts even though they have done much to hurt her. The shame of her father’s infidelity is something she has carried with her from the day she was born and she continues to carry that shame, virtually to the point of it being part of her identity. 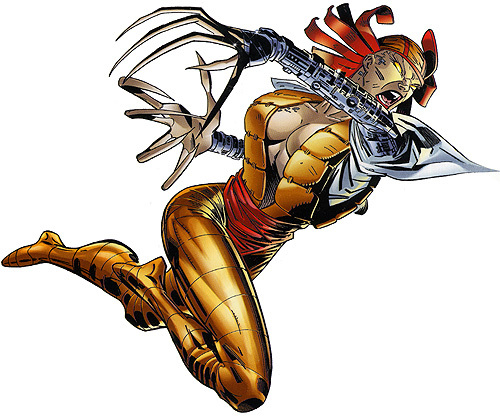 Her shame makes her an outcast and an adversary to all, a role that she eventually embraced as Deathstrike. Instead of being humbled by shame, Yuriko is strengthened by it. Being an outcast, Yuriko has a lot of anger to deal with. Her anger and hatred help her focus on those who wrong her and motivate her into regaining what she perceives to be lost honor. This is likely another reaction to her being an outcast. Having been denied honor due to the shame of her birth, she takes it upon herself to seize it. This added additional motivation as she trained to fight and helped fuel her anger in the future when she was betrayed by Harada and Wolverine. And if there was any sense of compassion within Yuriko Oyama, it died with Mariko and her father. Being the only ones that showed her compassion, they were the only forces that tempered her anger over being dishonored. This showed in the powerful emotions she once felt for Logan. Being an outsider, she was likely drawn to him in a way that was different from what Mariko found appealing. He gave her reason to believe that even an outsider can overcome the shame of the past and achieve honor. This made Wolverine’s betrayal much more painful, leaving her to take the extraordinary measures that turned her into Lady Deathstrike. Now with nobody left in her life to show compassion, she has become a ruthless and unfeeling killer. Her only guiding force now is reclaiming her lost honor, which may or may not be impossible at this point.